An annual sales event, the Back To School promotions are open to anyone who qualifies for Apple education pricing, which includes students, teachers, and college and university employees, among other people eligible to buy from the store. The promotion applies to purchases made through Apple's online Education store, Apple's retail outlets, over the phone via 1-800-MY-APPLE in the United States, and a limited number of campus stores. For qualifying Mac purchases, Apple will provide free Beats Solo 3 Wireless headphones, in the new Beats Pop Collection colors. The Macs are also available discounted at up to $200 off normal consumer pricing, with AppleCare offered at 20 percent off the usual retail price. The deals include MacBooks starting from $1,249, the MacBook Air from $849, and the just-updated MacBook Pro from $1,249. For the desktop models, the iMac is available from $1,049, the iMac Pro from $4,599, and the Mac Pro from $2,799. 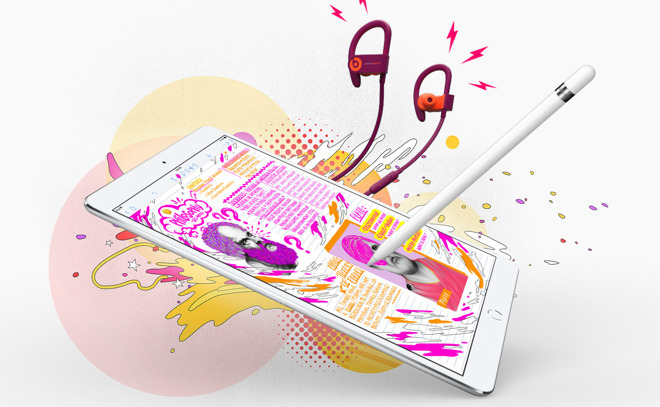 A similar Beats offer is being provided for the iPad Pro, with a pair of Powerbeats 3 Wireless offered with participating purchases, again using the Beats Pop Collection colors. The 20 percent AppleCare discount and educational pricing also applies to the iPad Pro in the sale, which is available from $629. Under education pricing, the Apple Pencil is also offered at a discounted $89, instead of $99. Apple's Back To School page also promotes other discount programs offered by the company, including the Pro Apps Bundle for $199.99, and Apple Music's student pricing of $4.99 per month. A College Essentials page takes visitors to other items that could be useful in higher education, including HomePods, AirPods, the Apple TV 4K, and assorted accessories. The promotion is running in a wide number of countries, including the United States, Canada, and Mexico, as well as markets in Europe, Asia, and the Middle East. In Europe, this includes the United Kingdom, France, Germany, Ireland, Italy, Belgium, Hungary, the Netherlands, Norway, Sweden, Finland, Poland, Austria, Switzerland, the Czech Republic, Denmark, Spain, Portugal, and Turkey, with the promotion also available in Singapore and the United Arab Emirates. There are several other ways to save even more without having to go through Apple's education verification process. Apple authorized resellers are currently discounting Mid 2017 MacBook Pros by up to $350 with exclusive coupons. Closeout iMac and MacBook Pro models are also on sale with markdowns of up to $1,300 off. Many resellers will not collect sales tax on most orders as well — and some offer 0% financing. To compare prices across all Mac lines, please visit AppleInsider's Mac Price Guide to find up-to-date deals and special offers.